Bloomberg reported today that the building which currently houses the massive Grand Hyatt New York will be torn down and replaced by a new mixed use building including a new Hyatt hotel. Hyatt has a 100 year lease for the premises which leaves them with a good 5+ decades at the prime NYC location next to Grand Central Station. The Grand Hyatt New York is a huge hotel and I first stayed there in the mid 2000s and while I was still Elite member with Hyatt back then, the hotel was a total bee hive with more guests than it could seemingly process and even charging guests for storing their baggage prior/past the checkout time. The hotel was first developed in the 1970s by no other than Donald Trump – this was his first ever development – who sold his half interest in the property to the Pritzker families Hyatt Corporation back in October of 1996 for US$140 Million. In most recent years the hotel has been mostly famous for crammed lounges, tiny rooms and mediocre service but with it’s demolition coming up there is no other chance but a restart for this horrible hotel. You can access the Bloomberg article here. The Grand Hyatt New York, the Manhattan hotel that launched Donald Trump’s career as a real estate developer, is being redeveloped by an investor group that plans to demolish the existing structure and replace it with a massive mixed-use building. 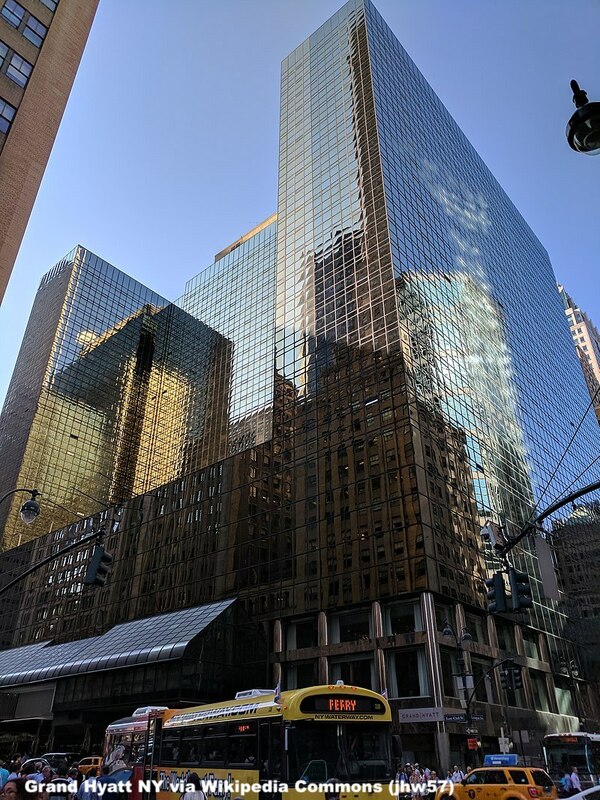 TF Cornerstone, a Manhattan developer, and MSD Partners LP, the investment firm that manages money for Michael Dell and his family, are taking control of the ground lease and existing hotel on East 42nd Street. They plan to replace it with a 2 million square-foot tower that includes office and retail space as well as a new Hyatt hotel, according to a statement. The developers intend to contribute air rights from Grand Central Terminal under the rules of a recent rezoning, according to the statement. The existing hotel, which will operate in its current form until at least the end of 2020, was developed by Trump in the late 1970s. In New York City’s highly competitive real estate and hospitality industry this will be a mammoth project which certainly takes several years to complete. According to the Wall Street Journal (access here) the New York Hotel and Motel Trades Council negotiated a US$165 Million buyout agreement with Hyatt according to which a 30 year veteran in the housekeeping department could walk away with $214,000 cash plus pension credits. The new Hyatt hotel is planned to have 500 rooms compared to it’s current 1,298 which slashes the capacity substantially. The new property will be much leaner and of course brand new. Hyatt has several other properties in the city now which they were able to acquire or at least manage (Hyatt actually owns very few hotels). Ever since the Andaz 5th Avenue opened that is my go to hotel in NYC and I think it’s fantastic. What I found very interesting when I read into this: Hyatt was actually limited by a noncompete clause in the partnership agreement with Mr. Trump that prohibited the hotel chain from opening another property in New York City. So without the 1996 sale Hyatt couldn’t have grown in NYC.